Please bring a unwrapped toy or suggested $10 donation. 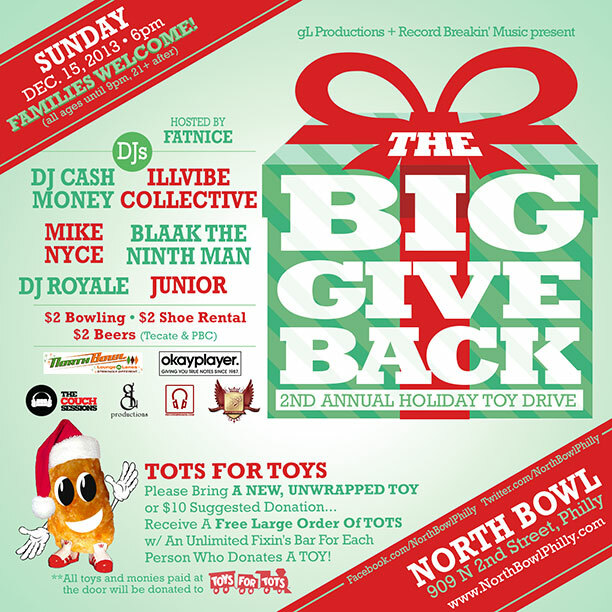 All toys and money will be donated to Philadelphia Toys For Tots! There is something about this time of the year that reminds us how blessed so many of us are and a way we can give back. Once again Record Breakin’ Music and gl Productions have teamed up for this our 3rd year of our annual The Big Give Back toy drive. This year we are partnering with the Motown On Mondays party at Silk City to host the event. Please bring any new and unwrapped toy and or a suggested donation of $10 on Monday, December 15th for less fortunate children and families in Philadelphia this holiday season. We are doing this because we want to share hope and compassion with others who may be struggling for whatever reason. We want to make a difference and need your help! ALL donations will be given to Toys For Tots – Philadelphia for their efforts to support those in need. Please bring A NEW, UNWRAPPED TOY or $10 suggested donation!